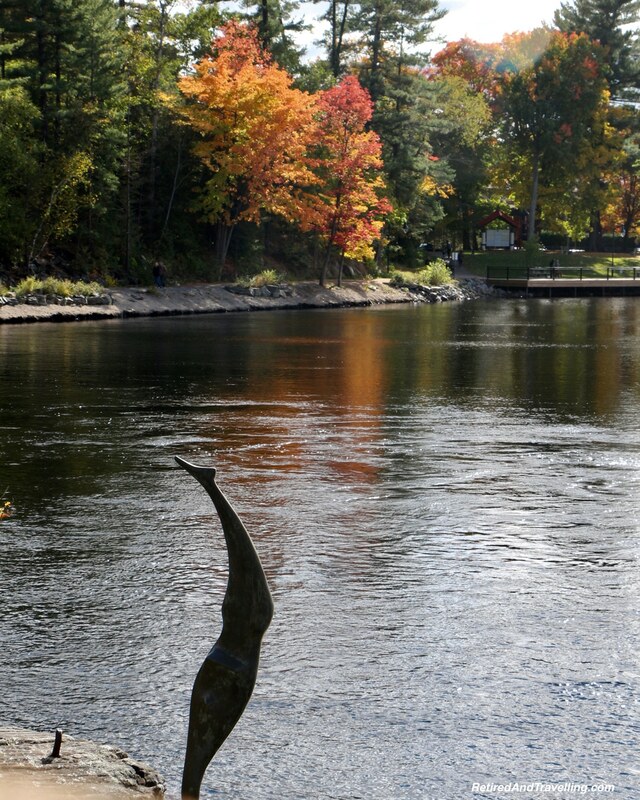 Heading north to Muskoka for fall colours would help to compensate for the cooling temperatures! It is always hard to witness the end of summer in Toronto. 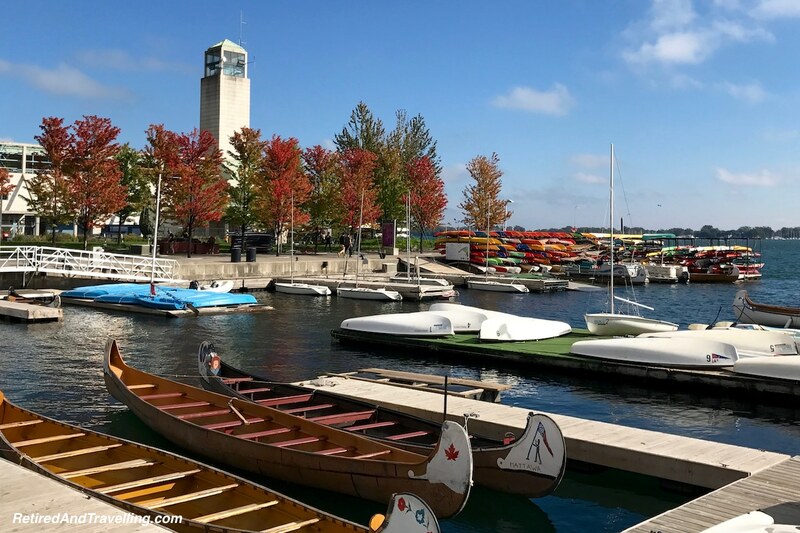 The Canadian National Exhibition (CNE) ends on the Labour Day long weekend. We were in town to watch the great airshow fill the sky with wonder and a fitting end to summer weekends. 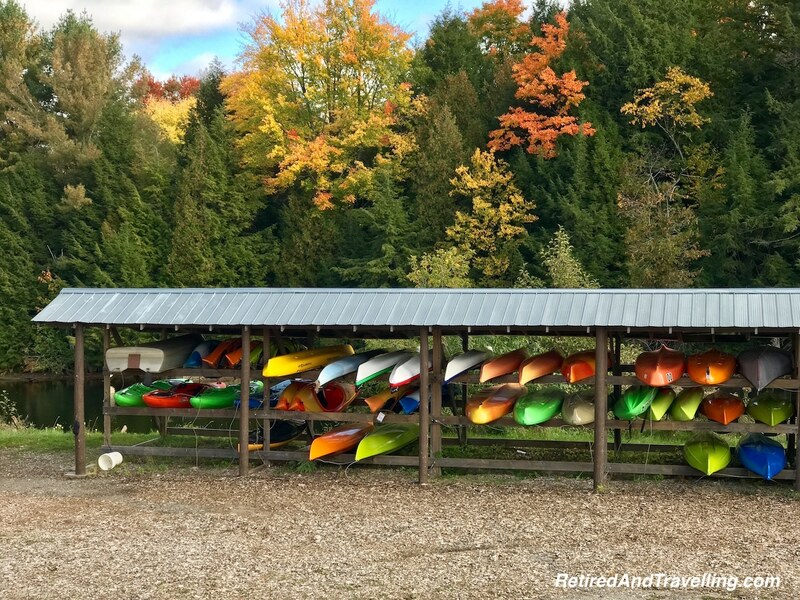 September gave us a reprieve with warm temperatures but as October rolled in, cooler nights started to give us a colour show, even in Toronto! 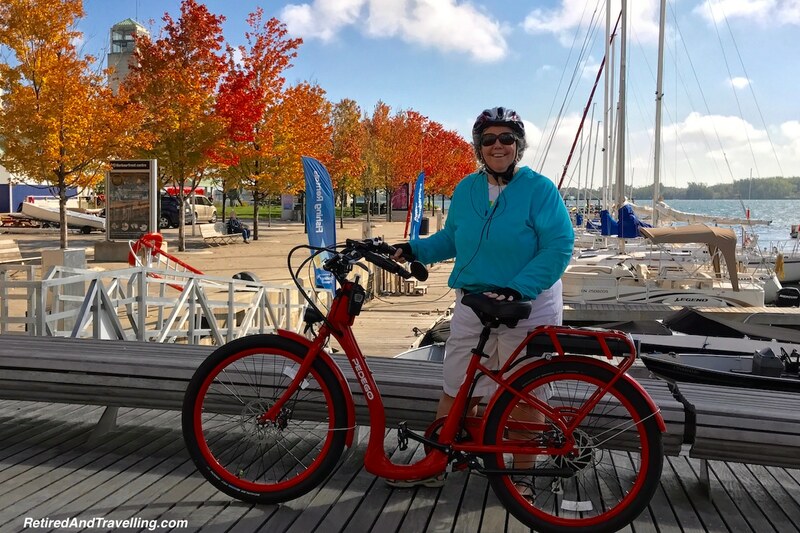 Walks and bike rides along the waterfront let us see the slow, gradual move into fall in the city. 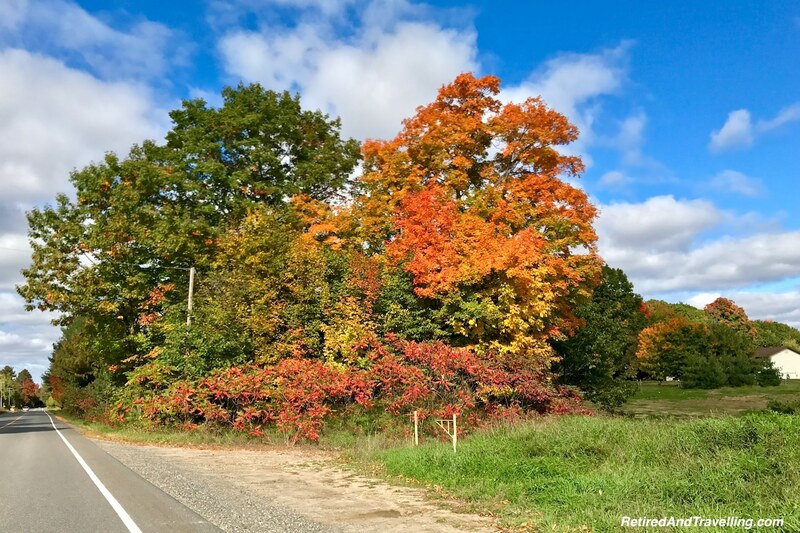 But on the Canadian Thanksgiving weekend, we went in search of the full changing of the colours. 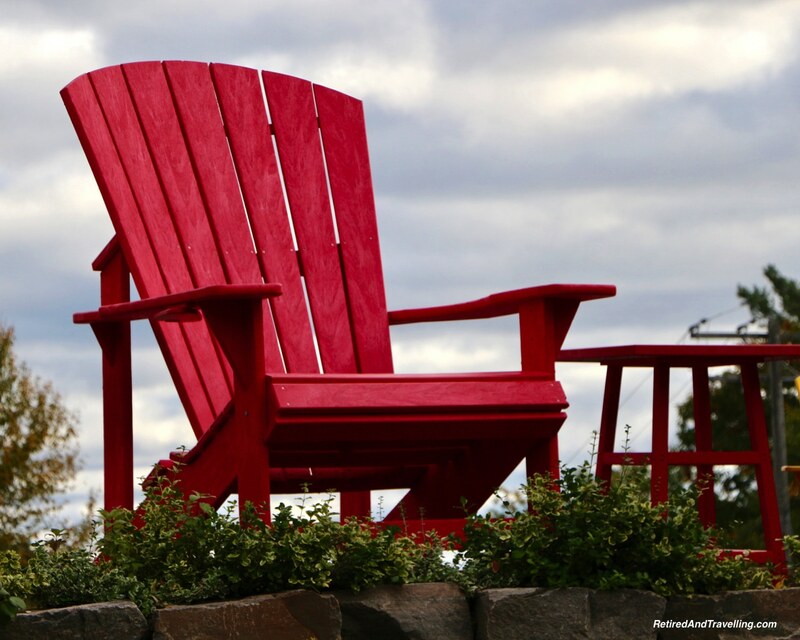 Heading north to cottage country is a weekly drive for many people living in the city. 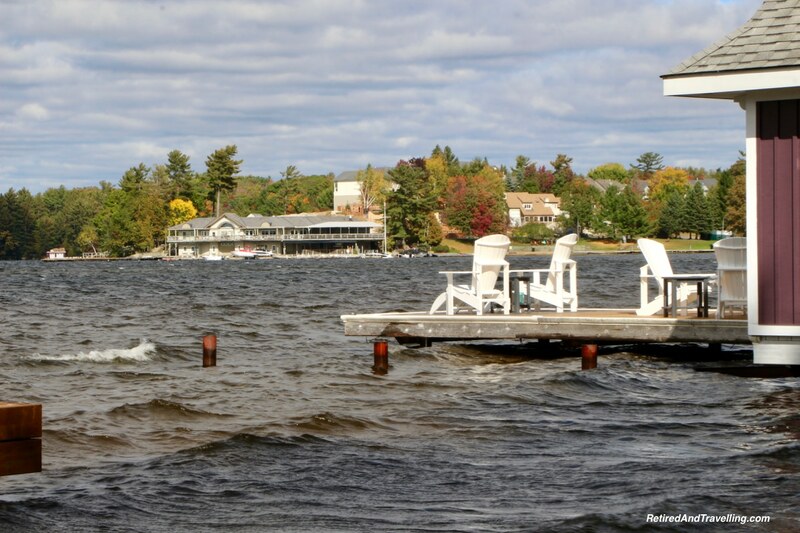 For many people, the Thanksgiving weekend is the time to head north to close up cottages for the winter. 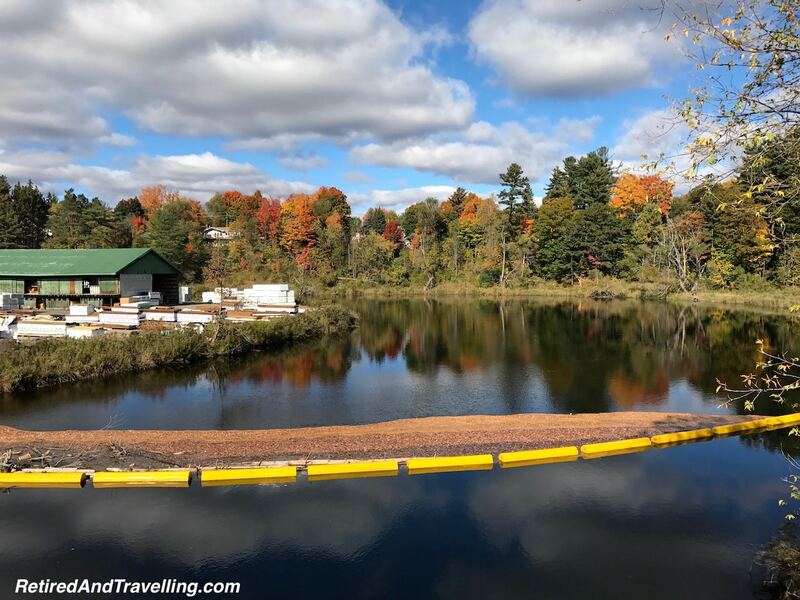 For us, this was the weekend to head north to Muskoka for fall colours. This is certainly one of the best places to marvel at nature’s show! 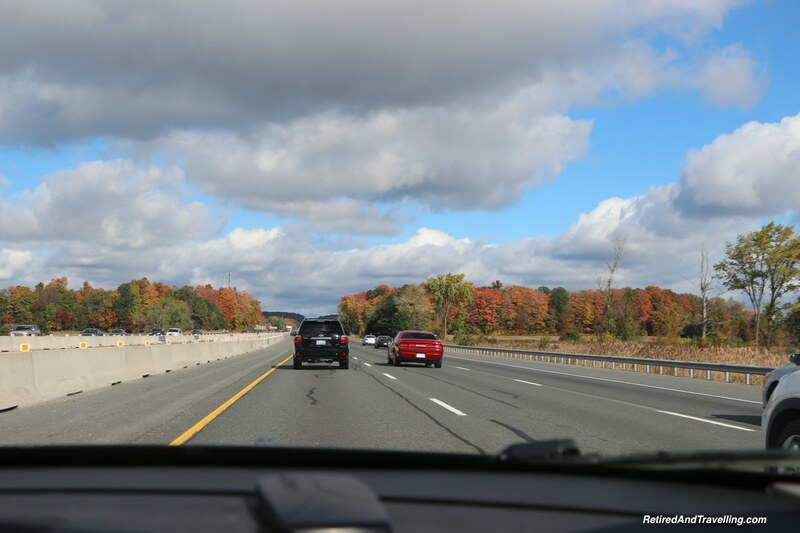 Heading out of Toronto up Highway 400, it was not long before we started to see the beautiful fall colours decorating the side of the highway. 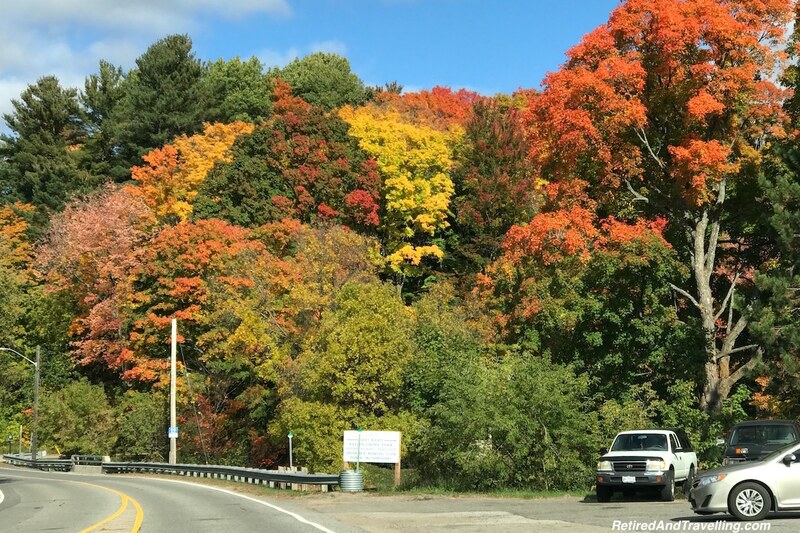 But we were not the only ones heading north to Muskoka for fall colours! 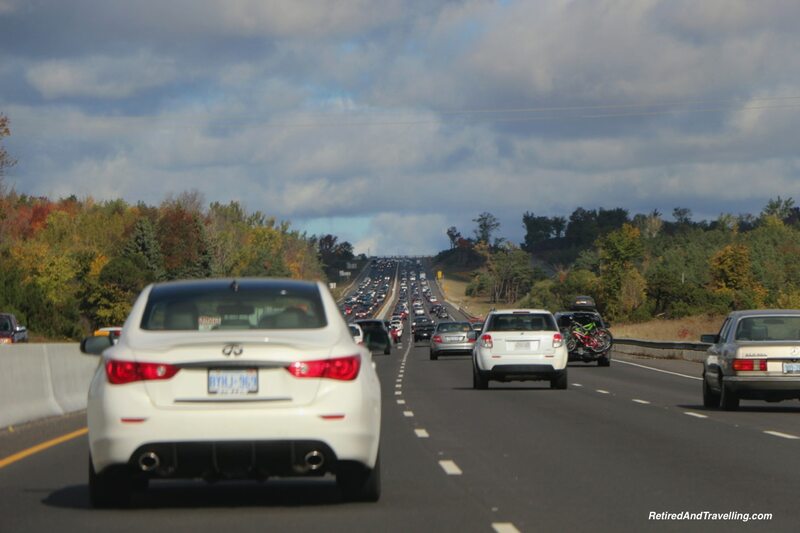 Traffic was generally fine until we hit the normal slowdown through Barrie. I can never understand how highway traffic can come to a virtual standstill when there is no accident on the highway. And then the traffic just magically starts to go again. Go figure! 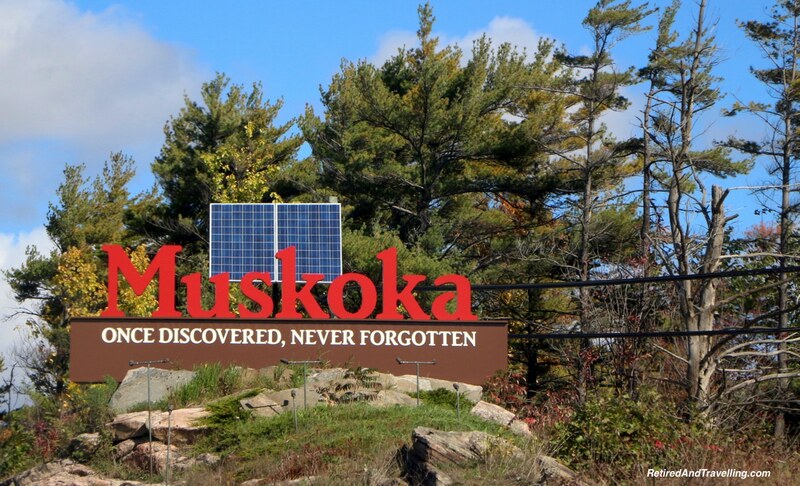 Our trip would take us north on Highway 11, then cross through the Muskoka Lakes and put us on Highway 400 back home to Toronto. 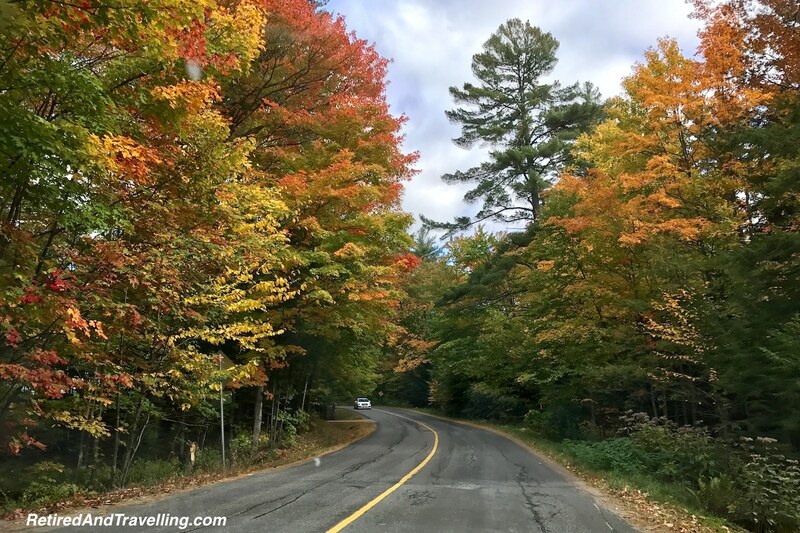 As we drove along the slower Highway 11, we could see the colours start to intensify, framed against iconic Highway 11 sights. 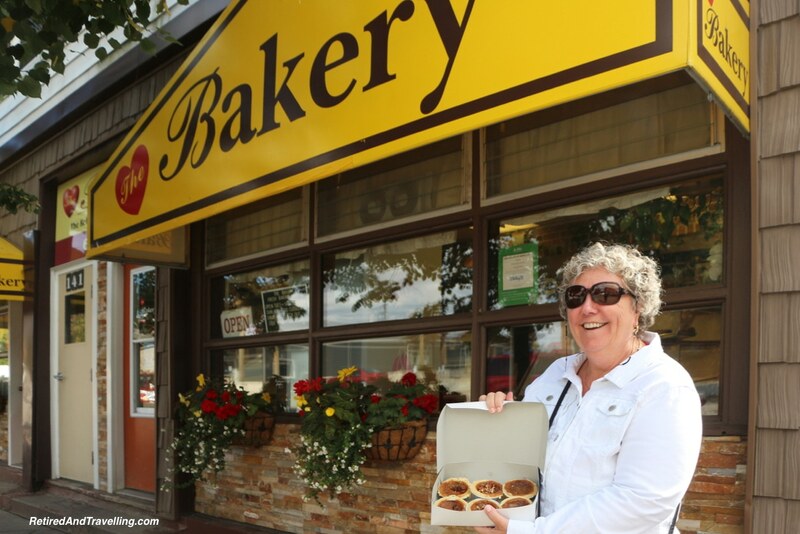 No trip north is really complete without a stop in Gravenhurst for butter tarts. 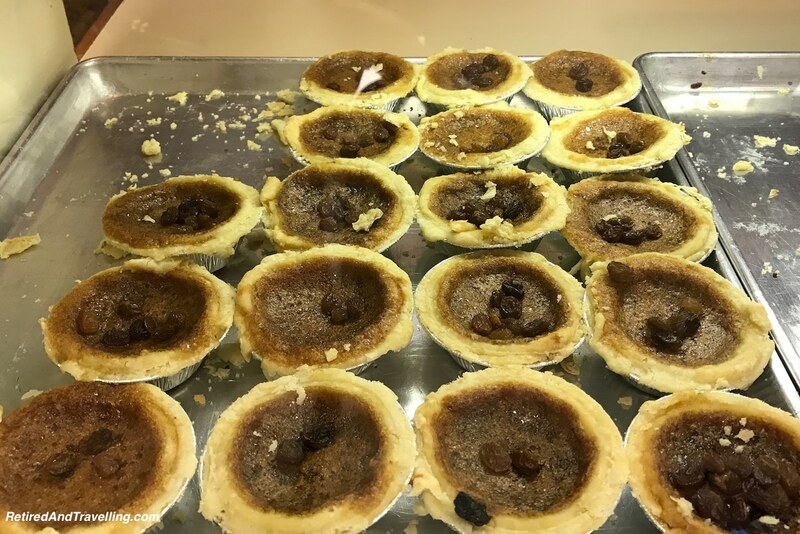 I am a butter tart snob and will travel for butter tarts. 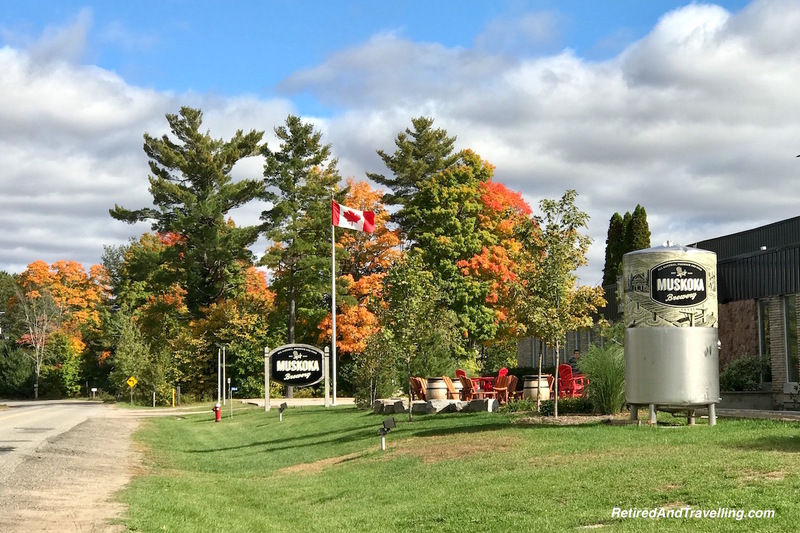 When I was still flying a plane, we were known to fly to the small airport in Lindsay for the butter tarts served in the local restaurant. 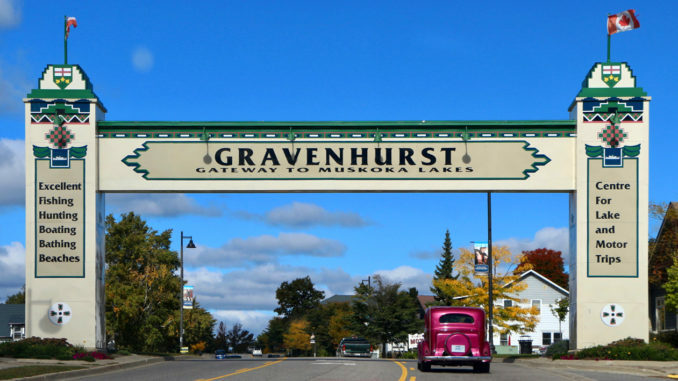 Gravenhurst was the home of one of my other favourite butter tart spots. The Bakery serves them just the way I like them – liquid and runny with sugar goodness! I might be missing the gym for this road trip but I vowed to make up for the butter tarts with a few extra sessions in the coming week. 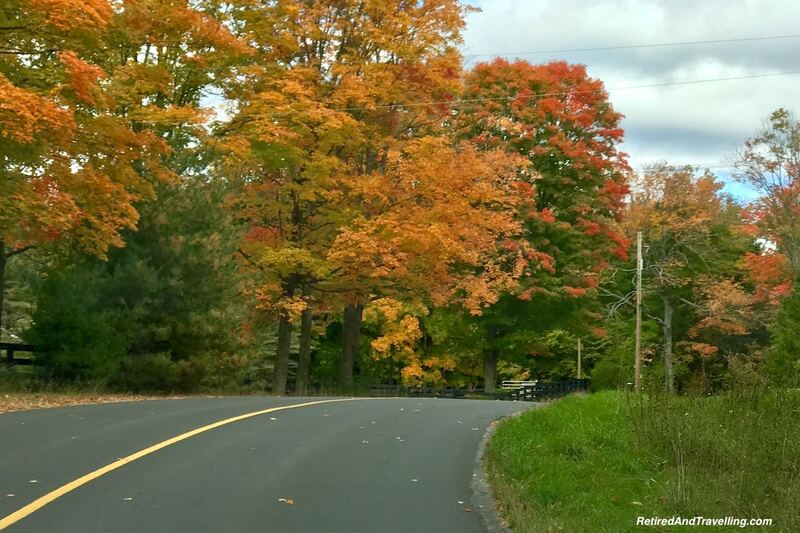 We travelled along the local roads of Muskoka for fall colours, enjoying the autumn palettes. 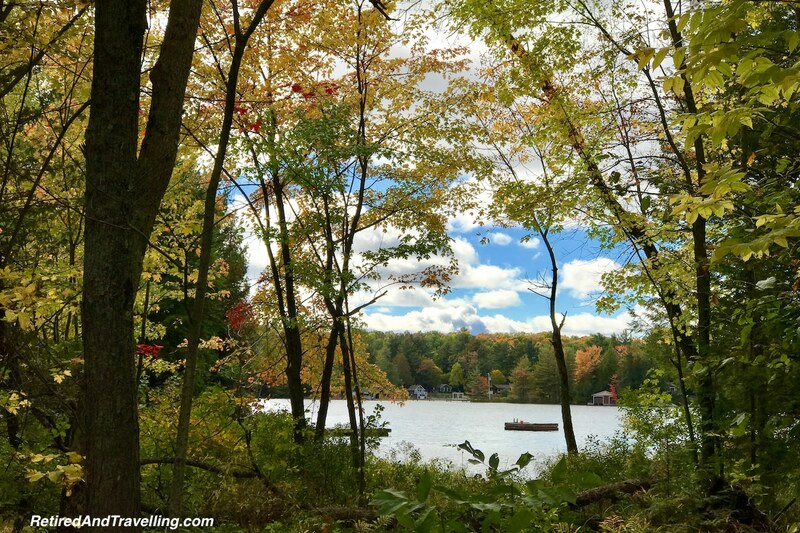 A few times we stopped to catch local sights and the cottage views. Detouring often in search of water, we were disappointed that the high winds were not offering up water reflections of the colours. Driving along the country roads kept us entertained. We were delighted with the reds and almost fluorescent oranges in the trees. The tree canopies at time offered tunnels to drive through. 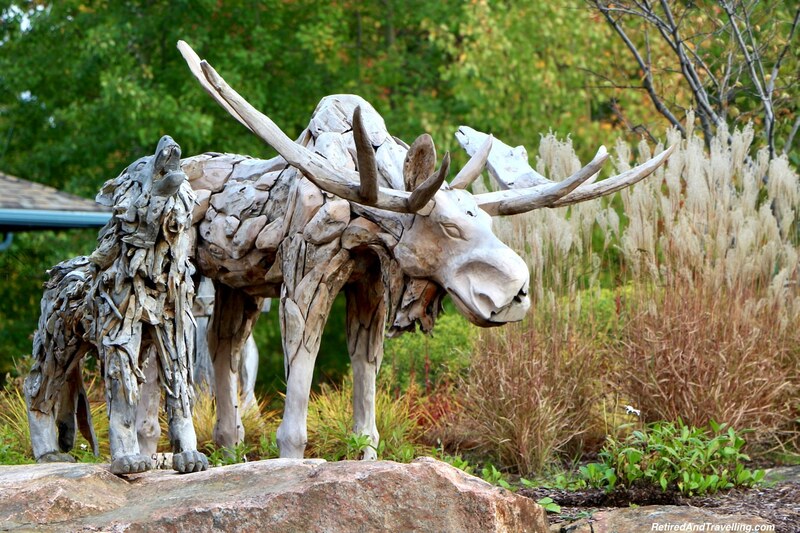 Everywhere we looked we were entranced with the majesty of nature. 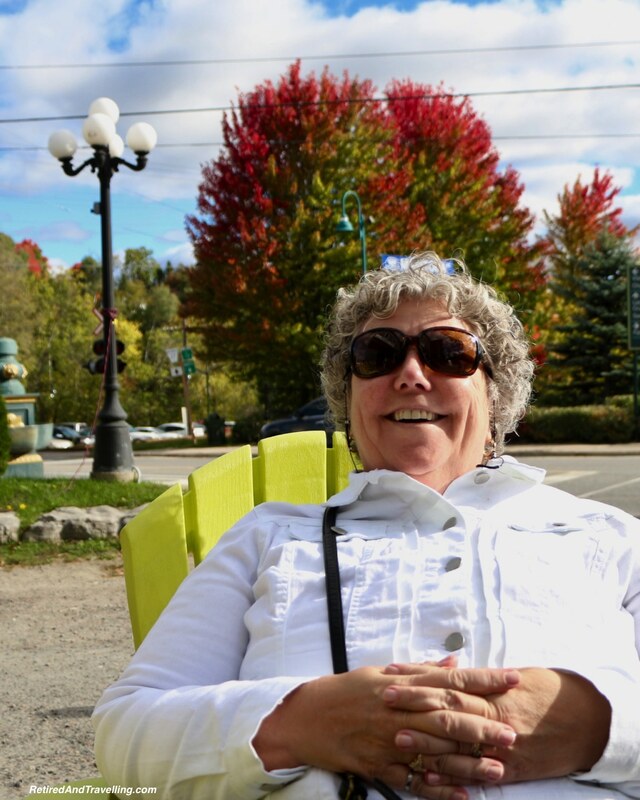 We finally stopped in Bracebridge to find coffee to go with our butter tarts. I could no longer resist their siren call! But before indulging, we parked the car to walk about the town and burn off a calorie or two first. The walk along the lake by the waterfall proved to be a popular spot for visitors. Even the waterfall was artistry framed in colour. 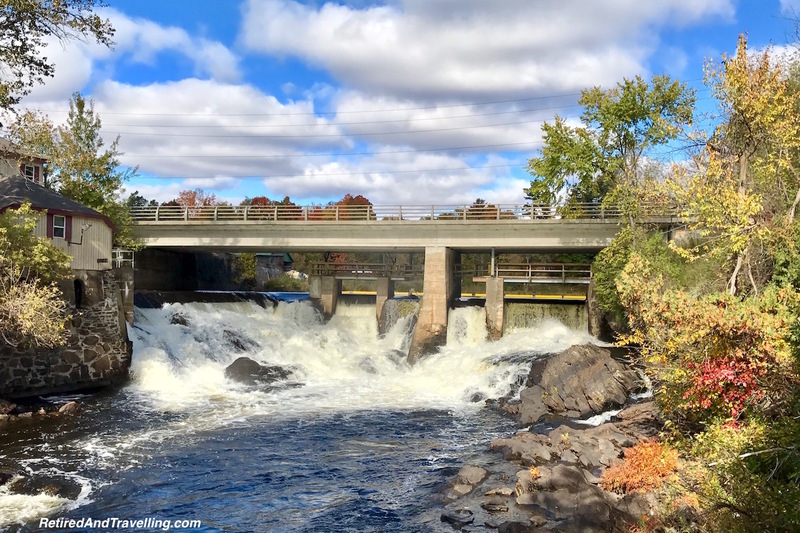 The lower falls and what was once an old mill provided yet more chances to catch the colours and the picturesque lake. Walking along the main street in search of coffee proved futile. As we had found when travelling in Italy in off season, not all places were open at the end of the season on a long weekend. But it was a good uphill walk. 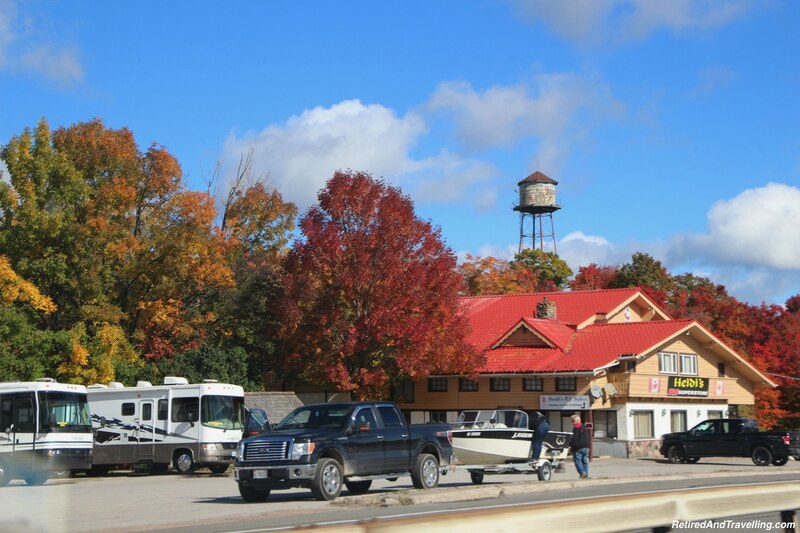 Wandering back down to the car gave us a chance to catch more images of this northern town as the colours changed. 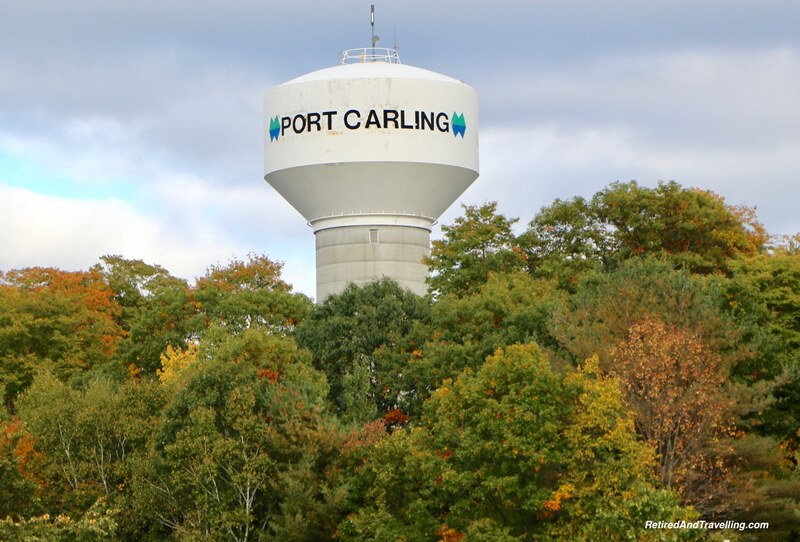 The next stop on our drive in Muskoka for fall colours was in Port Carling. 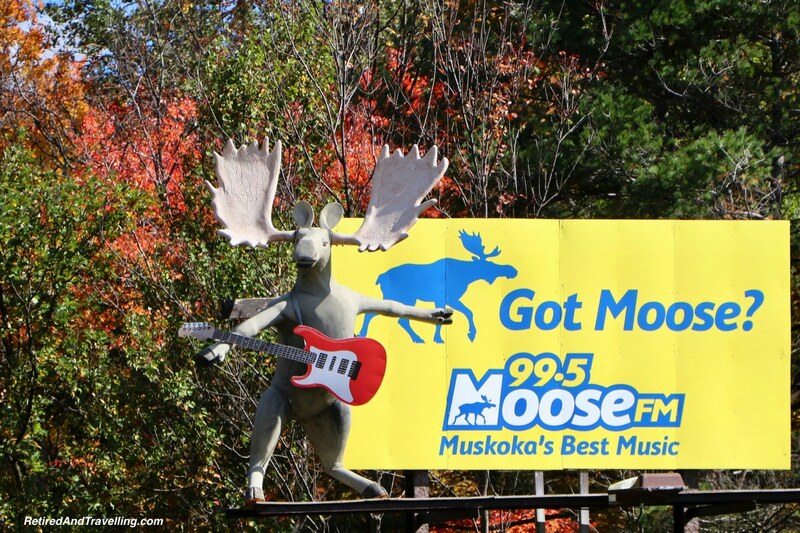 This is a favourite stop on any trip to cottage country. There are always interesting local sights to amuse us. We were hoping the locks had not closed for the season. 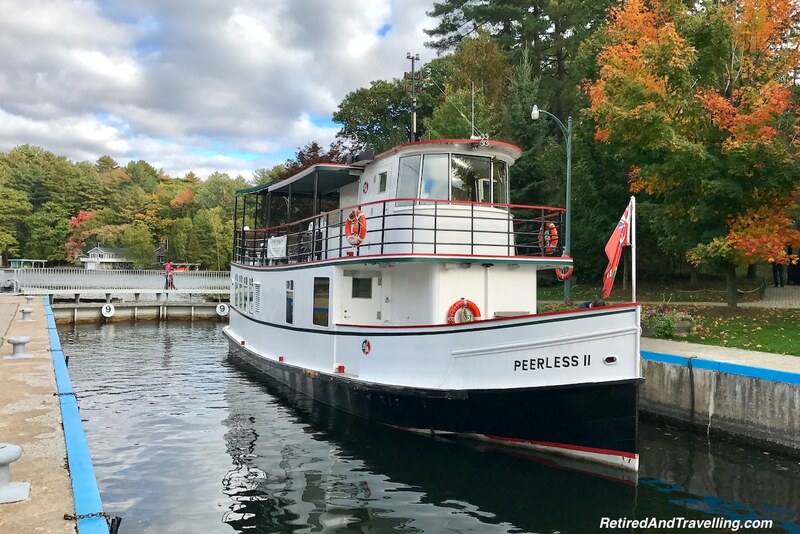 We managed to catch one boat making its way up the locks. We continued to wind our way along the country roads. 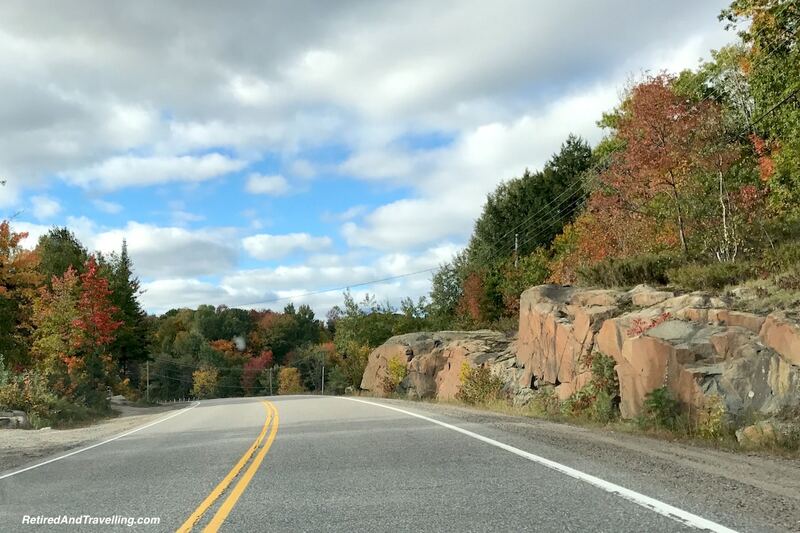 The iconic rocks of the Canadian shield framing the colouring trees assured us that we were still up north. 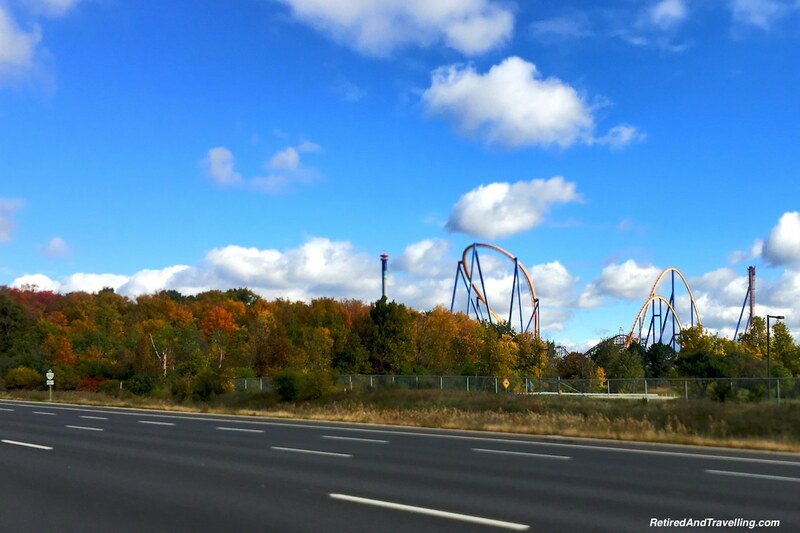 When we saw the signs pointing to Highway 400, we knew that it was time to turn around and head home. 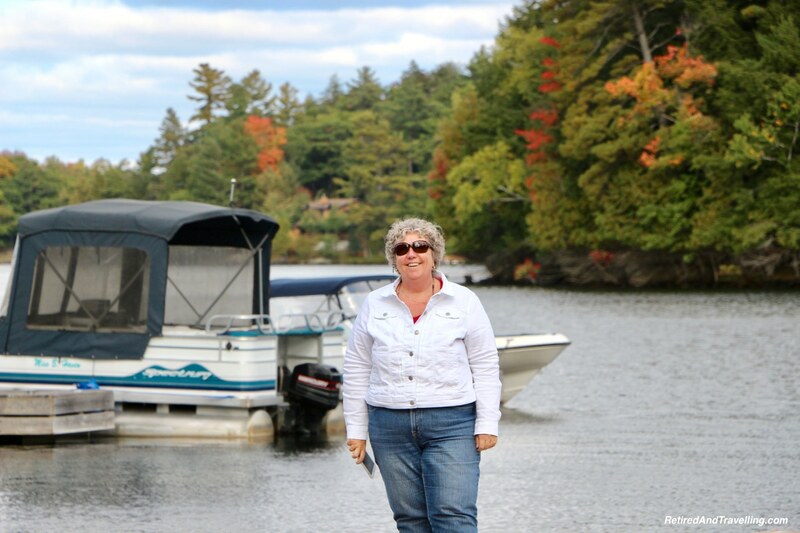 It had been a great day trip to Muskoka for fall colours. 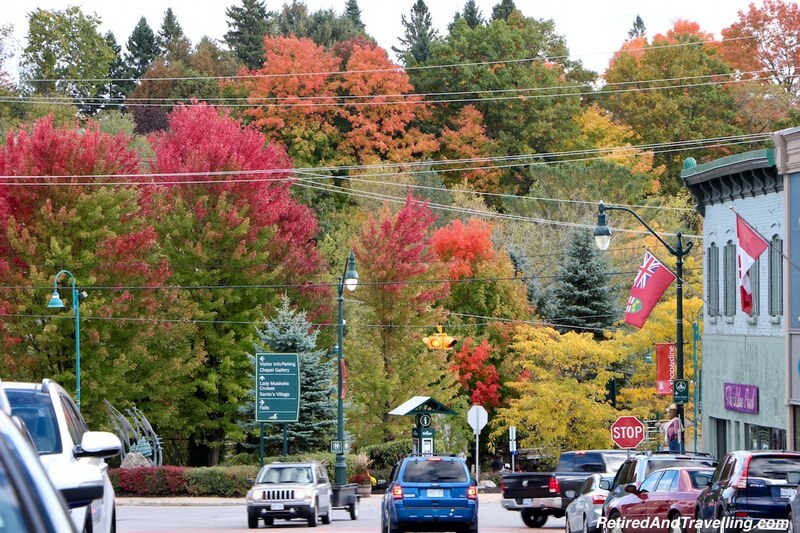 We were glad to have made it this weekend as it was clear there would not be many more weekends for fall colours. 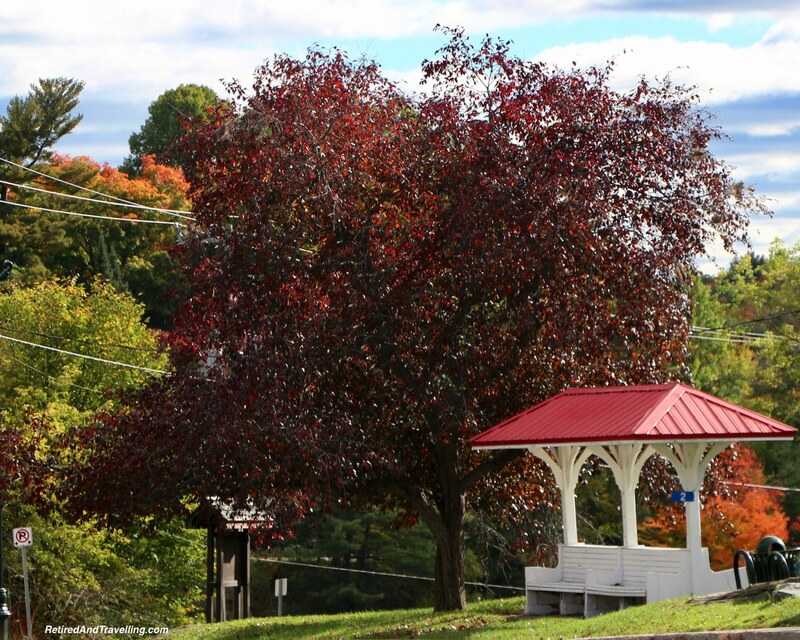 The nights were approaching the freezing point and the trees would start to drop their leaves quickly. But we were glad to have been home in the fall this year to catch the show. 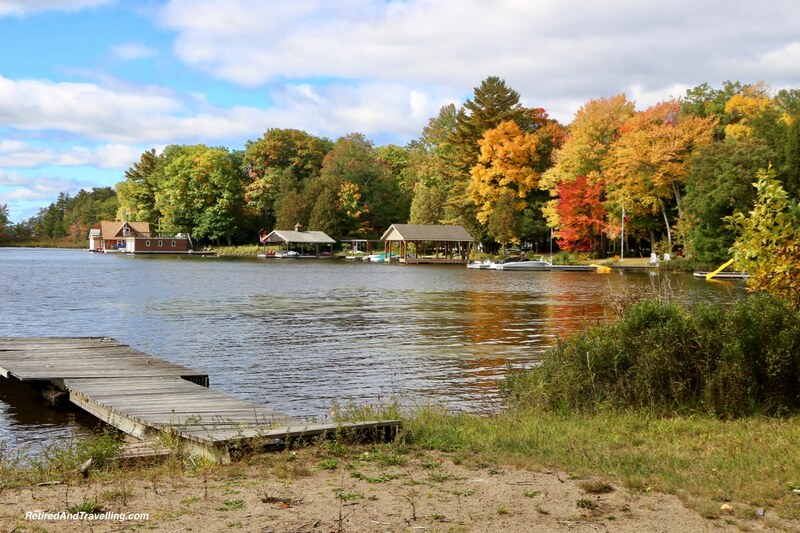 Have you visited Muskoka for fall colours? Was it a great treat? 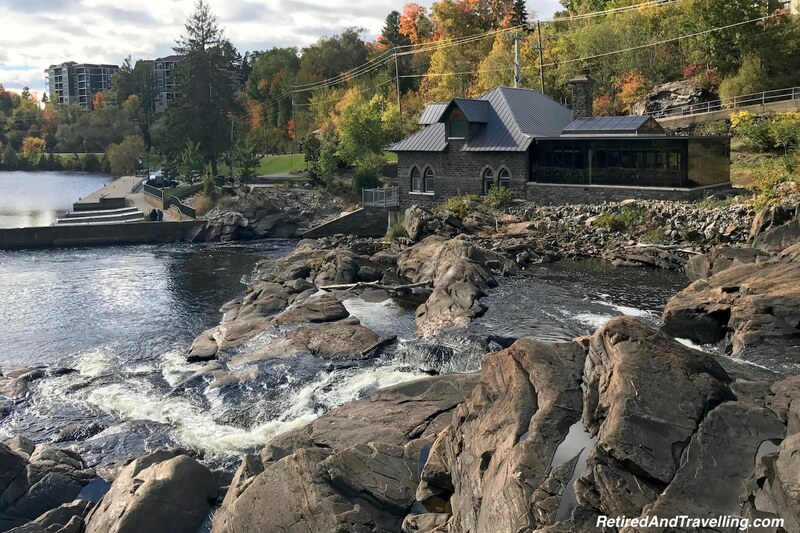 Is there another spot you would recommend for fall colours? 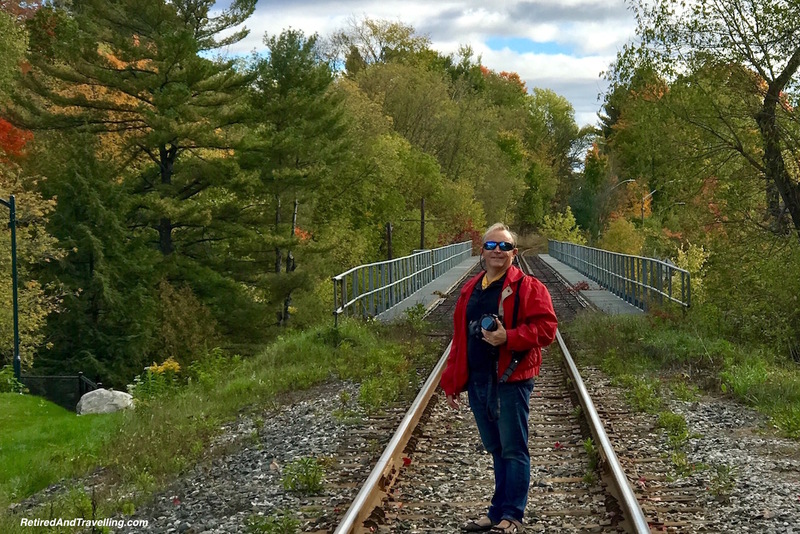 Travel blogger and photographer! Scuba diving, luxury cruising, chocoholic, sea and sunshine addicts, camera attached and just generally curious! Join us on our adventures! 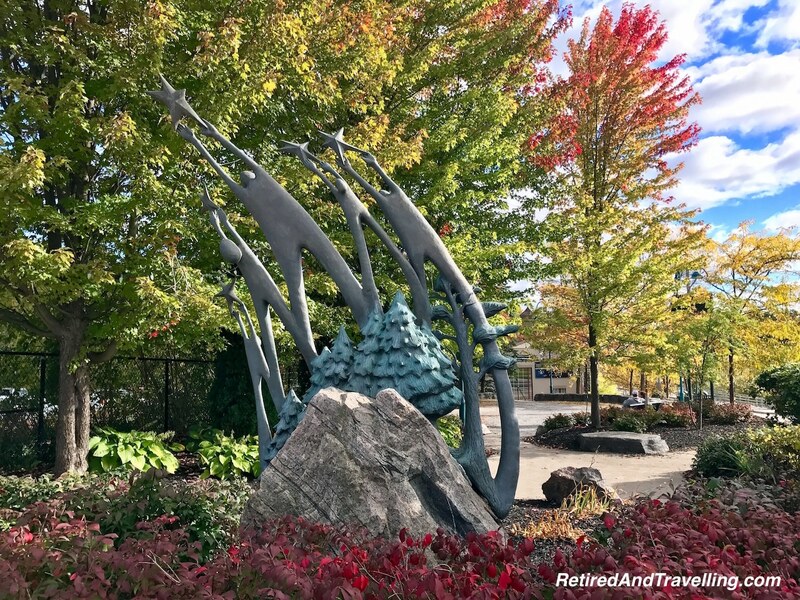 Travel with us to …. Home in Toronto. Planning for our next adventure for 5 weeks in British Columbia. 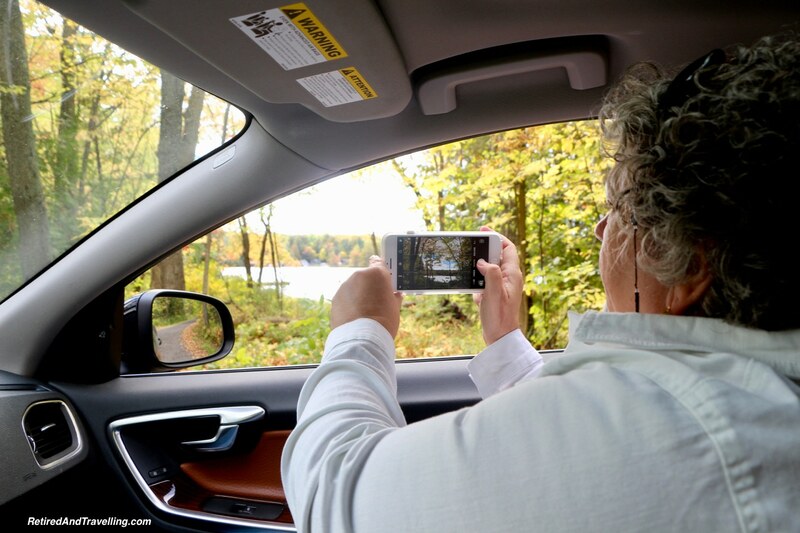 Subscribe to get updates on most current travels!